NEW YORK (Reuters) - Delta Air Lines wants to sell its oil refinery in Trainer, Pennsylvania, after attempts to offer a partial stake in the plant late last year failed, according to two people familiar with the matter. The Atlanta-based airline hired investment banks last year to organize the sale of a stake in its Monroe Energy refining subsidiary, signaling it wanted to share the risk of running an energy business. The offer failed to attract sufficient interest because a refinery on the East Coast is viewed as an undesirable asset given the rising costs of acquiring crude oil. 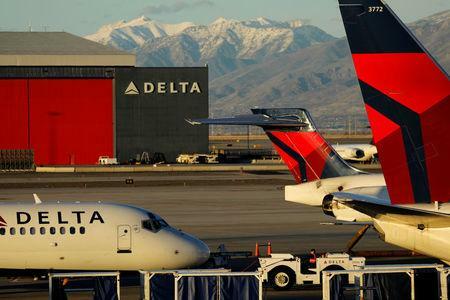 The airline, the largest in the United States by market capitalization, now wants to sell the entire plant with an eye toward finding a buyer that would agree to a long-term contract with Delta to buy the plant's jet fuel, the sources said. Delta spokesman Morgan Durrant declined to comment on the potential sale and shift in strategy, but pointed to comments made by chief financial officer Paul Jacobson last month when asked for an update on the search for a partner in Monroe Energy. "We have continued with that process and have received some interest in having discussions with parties. There's no update on the strategy broadly as we articulated," Jacobson said in a January 15 earnings call. "We're looking for ways to enhance the value and the strategic value to Delta of the refinery through a partnership and those discussions can be complicated," he said. The airline acquired the 185,000-barrel-per-day refinery in 2012 for $150 million in a bet that it could lower its cost of jet fuel, among the highest expenses for any airline. The refinery also makes gasoline and diesel for profit. The U.S refining industry has been consolidating into larger players that can use scale to lower their cost of buying raw materials and paying for regular overhauls. This week, oil giant Chevron announced plans to buy a small Gulf Coast refinery to increase its crude processing capabilities. Four refineries on the U.S. East Coast have closed in the past decade. East Coast refiners got a lifeline for a few years from the Bakken shale boom in North Dakota earlier this decade when high production forced producers to offer them steep discounts. The discounts have vanished in recent years as more pipeline capacity came online, however, reverting to the poor economics that hurt East Coast refiners a few years earlier. Delta has argued that keeping the refinery open by buying it was crucial. It said jet fuel prices would have risen across the Northeast if the facility had closed, hurting the airline’s results. More recently Delta has run the plant like a traditional refinery, choosing to make more of whatever refined product offered the highest margin.